I don’t know about you, but one of the highlights of the holiday season is indulging in huge amounts of delicious home-cooked meals and other treats. Can it really be the holidays without some good old-fashioned gluttony? Well, if you answered ‘no, it can’t!’ then the Arm-A-Dine might be just the product for you. As part of a collaboration between Australia’s RMIT University Exertion Games Lab and the Indian Institute of Information Technology Design, the Arm-A-Dine aims to make eating more of a social activity. In a research paper, the team explains that many food-related technologies are focused more on the preparation of food, rather than the actual experience of consuming it. With that in mind, the researchers have developed the Arm-A-Dine robotic arm on a harness that diners wear while they eat. 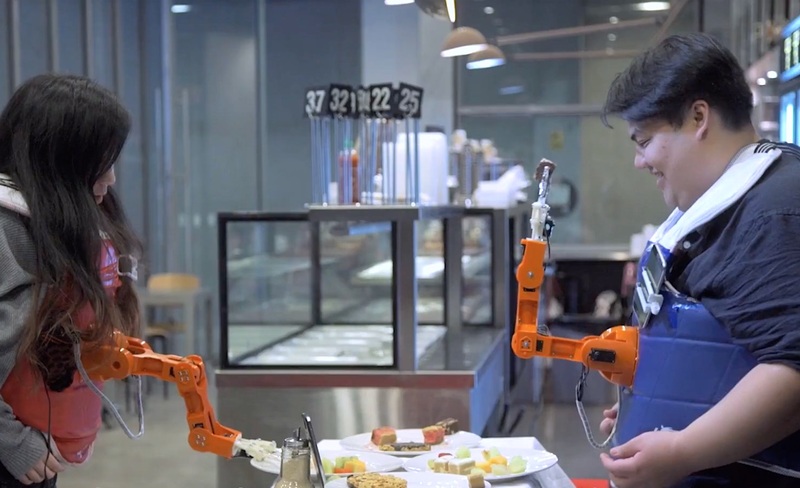 The arm not only picks up food from the table but can also determine who to feed it to. To do that, the harness uses a facial recognition app from an attached smartphone to scan the expressions of the other diner. If you smile, the arm will feed the other diner food, while frowning will have the arm give you the food instead. Neutral expressions will cause the arm to make ambiguous movements to keep diners guessing. All the while, the gripper will stop 10cm away from a diner’s face so it doesn’t actually make contact. While this all may sound weird, it apparently didn’t come off that way with those who participated in the experiments. According to the research paper, some diners found themselves getting nostalgic for when their mothers used to feed them as kids, while others noted that they were encouraged to smile more because of the expression-reading arm in front of them. That said, the Arm-A-Dine isn’t a commercial project at the moment, so it’s unclear when (or even if) it may make its way to a dining room table near you. Instead, the project serves more of a proof-of-concept for new tech and a study into making dining experiences more social and playful. In that sense, I think the researchers have an admirable goal here. Trying to get people to stop hiding behind their phones and start interacting more in-person while eating? That’s cool and I can definitely get behind that. However, the Arm-A-Dine seems like the wrong way to go about doing that. 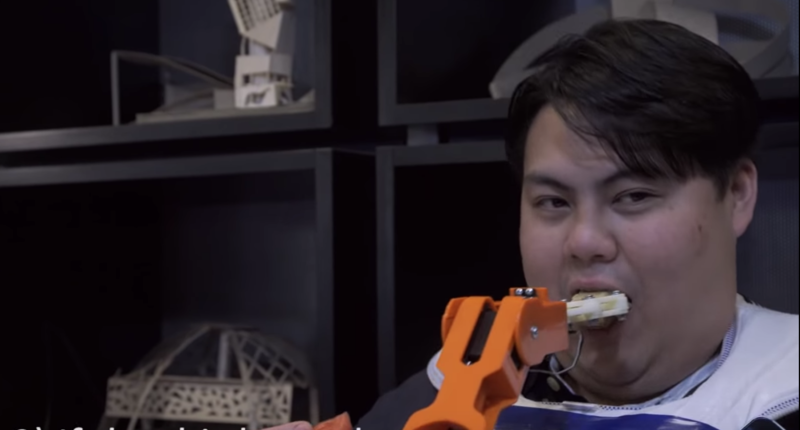 For me, seeing adults have food shoved in their faces by a robotic arm is a little offputting, to say the least. Unless you’re a child or someone with limited mobility (who don’t appear to be the intended audiences for this research, anyway), I feel like this tech would be too ridiculous and unnecessary for most diners. Assuming it even did become commercialized, it would likely cost a fair bit, too. Honestly, this just seems like it would be more at home in a quirky Japanese game show, or, if you’re more cynical, a step towards people becoming the hovering chair slobs from Wall-E. After all, the path to hell, as they say, is paved with good intentions. Note: This post is part of an ongoing series titled Sticky or Not in which staff reporter Bradly Shankar analyzes new and often bizarre gadgets, rating them sticky (good) or not (bad).